On 26 January 2018, a fire at the Sejong Hospital in the South Korean city of Miryang killed at least 41 people and injured more than 70. The blaze occurred one month after 29 people died in a gym fire in the city of Jecheon. The fire began on the first floor of the Sejong Hospital at 7:35 am. At the time, there were over 100 patients in the main hospital and 94 in the adjacent nursing home complex. The astrogeographical positions of places for the supraregional, international field level 1 can be astrologically interpreted to understand which topics of the larger, national and continental area culminate in an event at the particular place. My theory in the astrological measurement of the morphogenetical surface field of our planet assumes that any event is an expression of the flow of energies, resonance and exchange of information of the processes that the earth, humans and other living beings are going through. Catastrophic events function as discharge of blocked energies and also as stimulation of solutions of the causes of such blocks and issues related to them. In modern information society and human reflection such events cause some form or process of awareness or the need to perceive, feel, think about or analyse the information about events. Astrogeographic position of the City of Miryang for morphogenetic field level 1 which describes the supraregional, international topics of the city: Miryang has one coordinate at 19°Scorpio and one at 15°Taurus. 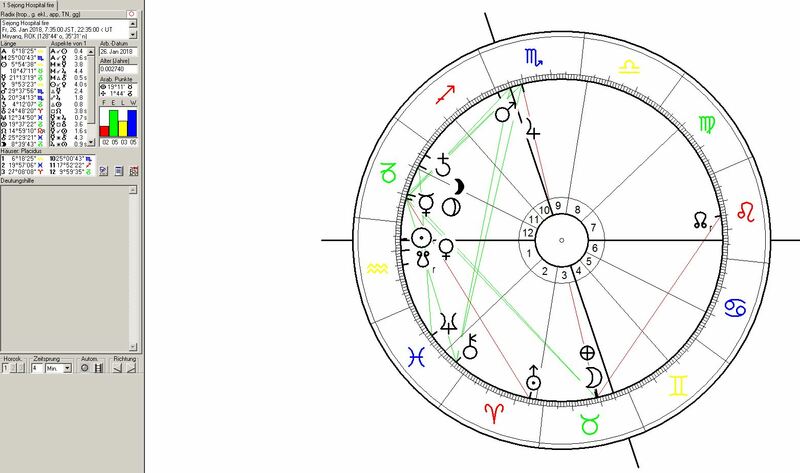 The Sejong Hospital fire occurred when the Moon at 18°47° Taurus was exactly opposite the 19°Scorpio astrogeographical coordinate of the hospital. Jupiter the ruler of fire sign Sagittarius and a major indicator for arsonists now at 20°Scorpio had been transiting the exact resonance degree with the position of the City of Miryang during the last 3 weeks. The intensity of these astrological transits in relation to the astrogeographical resonating degrees is outstanding and really extreme. Even more so as the North Node at 15° the very center of fire sign Leo was in exact square and tension to the 15°Taurus astrogeographical coordinate of the City. In regard to the topics of the fire for the country and east Asian region the position of the North Node stands for energetical topics having to do with blocks of individual self-expression and all topics of individualization. A question arises in what way the Mioryang Fire is to be understood as an expression of the tension that have to do with the tight and hostile situation between the 2 Korean countries and also with China. The capitals and governments of North Korea (19°Leo) and China (3°Leo) both have astrogeographical coordinates in Leo . Pyongyang`s coordinate at 19°Leo lies in exact square to Miryang`s 19°Scorpio coordinate suggesting that the extreme pressure from North Korea is a central energetical topic of the Miryang Fire. Beijing lies at at 17°Sagittarius plus 3°Leo revealing the support of the extreme energetical and psychological tension exerted onto South Korea by the chinese government. The Mercury – Pluto conjunction in house 12 directly points at some form of manipulation or even an arson attack as the cause for the fire. Even more so because Saturn which as the ruler of Capricorn was also the ruler of house 12 was located in house 11 the house of escaping. The fire appears to have broken out exactly at sunrise. The sun so was cinjunct the ascendant and the MC conjunct the half-sum between Mars and Jupiter. This means that all three rulers of the fire signs were involved in that moment. This intensity of this constellation of the energies of fire signs stands for a moment in time when unexpressed emotionality, paralyzed stimulation and supressed energies sought a way to be released and expressed. The superheat of this coverall constellation suggests an extreme case of rapid fire.